SAN DIEGO – The teenager in your family may be interested in two related websites. One, www.motivsandiego.org, will introduce him or her to opportunities around the county to volunteer, and to thereby earn community service credits that are important on college applications. Although operated under auspices of the Jewish community, the Motiv website is available to teens of all faiths (or none). Those teens who become involved in any of a variety of community service projects will be able to receive verification of their community service hours for their college applications. The other site, www.sdjewishteens.org, is operated under the same auspices, but it is specifically geared to Jewish teenagers. It highlights various opportunities within the Jewish community not only to volunteer, but also to undergo leadership training, socialize with teens with similar interests, learn of internships, and apply for college scholarships. 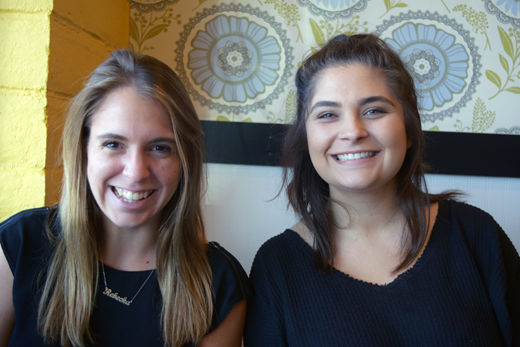 I had the opportunity to talk recently with Rebecka Handler, director of the San Diego Jewish Teen Initiative, and Emily Adelman, the organization’s communications associate, at the Trails Eatery in the San Carlos neighborhood of San Diego. They told me that the Teen Initiative is co-funded with a $1 million grant from the Jewish Federation of San Diego County and The Jim Joseph Foundation. The project’s staff is housed at the Lawrence Family JCC, which also provides supervision and payroll services. A survey indicated that there are approximately 7,000 Jewish teenagers currently living in San Diego County, and of these approximately 3,600 have been identified. The goal of the Initiative is to get 40 percent of the 7,000 teenagers – or 2,800 – actively involved in the Jewish community. Currently, according to Handler, about 18 percent of the local Jewish teen universe has been engaged—or approximately 1,260 teens. This is not as discouraging as it may sound, as the first part of the project was to create the infrastructure for identifying Jewish teens. With that now done, the project is moving into an expansion phase, she said. Handler said that she likewise had been involved in BBYO (B’nai B’rith Youth Organization) during high school, but really had little other involvement. She said that she too could have benefitted from knowing that there were Jewish organizations available to her that were geared to her specific career, hobby, and social interests. Most Jewish teenagers do not belong to even one Jewish organization, so Handler’s and Adelman’s experiences represented greater involvement than the average. One of the ideas behind the San Diego Jewish Teen Initiative is that instead of trying to persuade teens to affiliate long-term with one or another Jewish institution, the Jewish community should provide short-term opportunities for them based upon their interests. Thus, on the sdjewishteens website, there are entries for opportunities in arts and sports, martial arts, social justice programs, social networking, the March of the Living, teen leadership, and travel, among others. If they enjoy these activities, they may decide to check out other communit opportunities. Additionally, there are links on the website to internship and scholarship opportunities offered through the Jewish community. The San Diego Jewish Teen Initiative is what you might call a sub-granting agency. It doesn’t need the entire grant it received from the Jewish Federation and the Jim Joseph Foundation just for internal operations, so it provides grants to a variety of Jewish organizations and teachers to further the community’s outreach to Jewish teens. The organization provides professional development opportunities for educators working with teens at Jewish day schools and supplemental schools. It sponsors workshops in such fields as mental health certification, working with LGBTQ+ students, and learning from the Anti-Defamation League about dealing with anti-Semitsim. Approximately 20 educators attend each workshop, Adelman said. Additionally, said Handler, “We provide funding for existing organizations to strengthen their programs” for teenagers, and in the case of BBYO, which has been long dormant in San Diego, the initiative has provided start-up funds to pay for a staff member specializing in community organizing. Another initiative allows educators working with Jewish students to submit program ideas, which Handler shapes into proposals that go before the organization’s grant committee. One successful application involved taking 11th graders at Camp Mountain Chai to the Dominican Republic where they participated in service projects. To qualify for inclusion in that program, students had to participate in at least four service projects at home, so both countries benefitted from their efforts. To build teen infrastructure, the San Diego Teen Initiative has created first- and second-year peer leadership fellowships. “The first-year fellows create a social network of all the people that they know who are Jewish in the community and they act as ambassadors to connect with those people and to tell them about all the different options that are out there based on that audience’s interests,” Handler said. Nine students from the pool of 26 first-year fellows will travel to Boston in the future to meet and train with peers from that city, Cincinnati, and Los Angeles. “This is the first time that this training has taken place; they will see that the work that they are doing is bigger than just us,” Handler said. Locally, the initiative has sponsored a Teen Leaders Forum at which 60 teens representing 17 community organizations gathered for a day of leadership training. Ian Kandel, national vice president of the two B’nai B’rith Youth Organizations – AZA and BBG –was the keynote speaker, whose presentation was followed by breakout sessions led by leaders in the local Jewish community. As the Jewish Teen Initiative gathers momentum, Handler said programs are being conceptualized to reach out to 8th grade students, so they will know even before arriving at high school about the volunteering and networking opportunities available to them. Furthermore, she said, the initiative’s staff is mulling how to keep involved the alumni of the program – that is, teens who already have graduated from high school. Handler was graduated from Pennsylvania State College (at College Station), and worked on the BBYO staff after having come up through the student ranks. From there she went to Washington D.C. to the Joint Distribution Committee, where she worked on programs to foster cooperation and friendships among Jewish youths of many countries. She has served as the San Diego Jewish Teen Initiative’s director for approximately seven months. Adelman went to San Diego State University, where she majored in graphic art. She is in charge of the initiative’s two websites, while also being responsible for marketing and communications.